2017 was a great year for Gorey Agricultural Show, we had a huge turnout, and the fine weather ensured a great day out. Wright Insurance Brokers, our main sponsor are on board again and will be anchoring the Indoor Trade Stand Tent. They will be entertaining the small folk all day with a puppet show and other activities. Call in and meet them! Last year Slaney Foods International teamed up with the Irish Hereford Breeders, and we had Hereford cattle coming from as far away as Kerry. We were delighted to see such a massive turnout. So far, we have had a lot of interest both from exhibitors and spectators, and our schedule is available for download. Entry forms can be downloaded too. However, it is far easier and much more economical to enter online, as well as being better for the environment! Our Vintage section is always very interesting, with all sorts of machinery and implements on display. Bringing all this machinery to the Show is a huge job, as a lot of these machines don’t travel too fast! Our indoor craft and children’s tent was an enormous success last year, we have some new competitions for 2018, and these can all be found in the schedule shortly. The pets corner is running a new category this year called 'most unusual pet' - this may mean different things to different folk, but we would encourage you to consider bringing your pets to the show, and putting them on display in the pet’s corner. Seamus long will be on stage again, so get out your dancing shoes and practice your party acts.................this area will have tables and seating, so kids can run about and the adults can rest and relax. The Food Village will be adjacent to the stage, so you can sample all sorts of delicious nibbles. The committee of Gorey Agricultural Show would like to thank most sincerely Michael Lacy and Tom Stafford for providing the marvelous site. 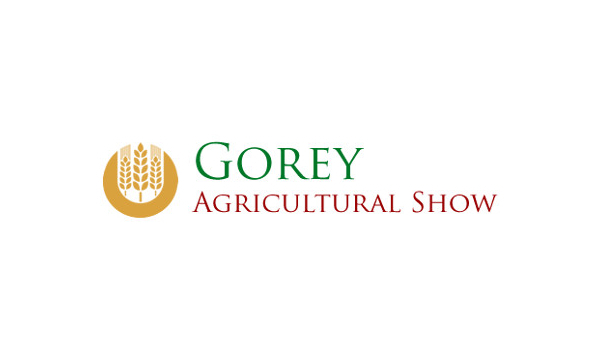 We would like to thank all our sponsors for their support in making Gorey Agricultural Show the success that it is. And very importantly our volunteers, without whom Gorey Agricultural Show would not happen, these volunteers give of their time freely, many spend the entire week in the field preparing it! The volunteers lend us their time, machinery and skills without fail, and for this we are very grateful.